Learn authentic Sichuan Cuisines with fun and savor the most exhilarative part of the city! Chengdu cooking offers a variety of selected curriculum of cooking classes such as Customized Cooking Class,Classic Sichuan Cooking Class,Corporate Cooking Class and so on to walk you through comprehensively the cooking procedures of typical Chinese cuisines and dim sums in an easy and fun ambience. Qiao, enjoying travelling and gourmet as well as life, was born in Chengdu. At the age of 28, Qiao made a very bold decision: with the idea of seeing the world, he quit his steady and well paid job in South America, and then embarked on a journey around the world, from Brazil to Colombia, Mexico, United States, South Korea, Thailand, Vietnam etc, leaving footsteps in more than 20 countries. Qiao had tasted the local foods during the trip, and got to know the story behind a dish, the change of a city and the culture of a country. 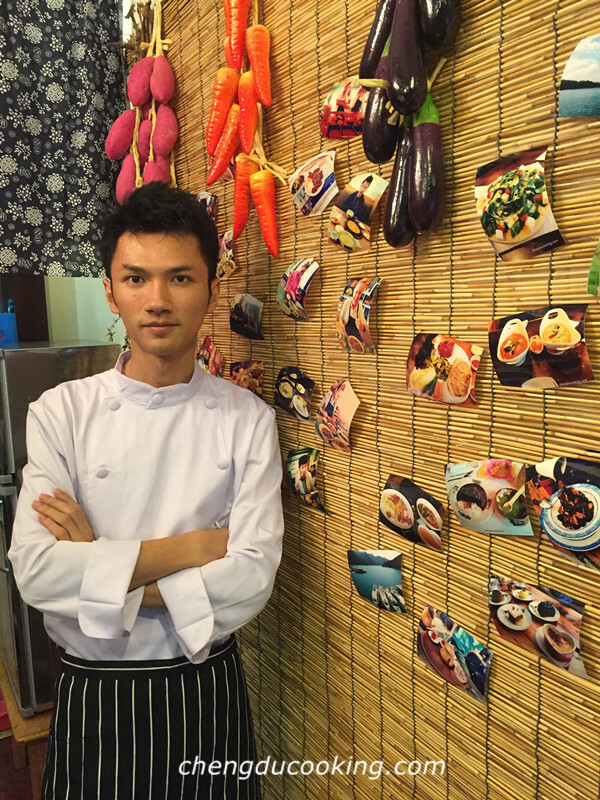 In 2015, Qiao came back to Chengdu and founded chengducooking studio, devoted to spreading Sichuan Cuisine culture to foreign friends from all over the world, through which, he hoped the world would know more about Chengdu, Sichuan and China. In the upcoming 2018, Qiao will continue traveling around the world, introducing and arranging cultural communicating activities together with his cookbook Sichuan Cuisine Goes Around the world, so that more people will have the chance to taste Sichuan flavor. Let the attractive flavor Ma (numbing), La (spicy), Xian (Umami) and Xiang (Fragrance) become a fashion element and be popular everywhere in the world. Qiao spent some time growing with his grandmother. That was a beautiful and happy memory. Grandma loved him a lot and cooked many delicious dishes for him every day. That made his taste critical day by day. Till now, he still keeps the fresh memory of Grandma’s cuisines: twice cooked pork tasted fragrant and chewy, poached sliced pork tender and smooth, home flavor tofu spicy and numbing. When grandma was cooking, Qiao would slip into the kitchen, watched carefully while grandma was cooking. The sound of cutting, stir-frying and sizzling before the dish was placing outside together with the fragrance of chili, broad bean paste, Sichuan peppercorns, ginger, scallion and garlic always made him excited and mouth-watering. To Qiao, food is a flavor of relative, links the feeling, and that makes an authentic taste. Qiao learnt not only the secret home recipes from grandma, but also the merits of diligence, kindness and honesty.